When I’m on my break, the people in the cafe are usually frozen in position, reading or studying. 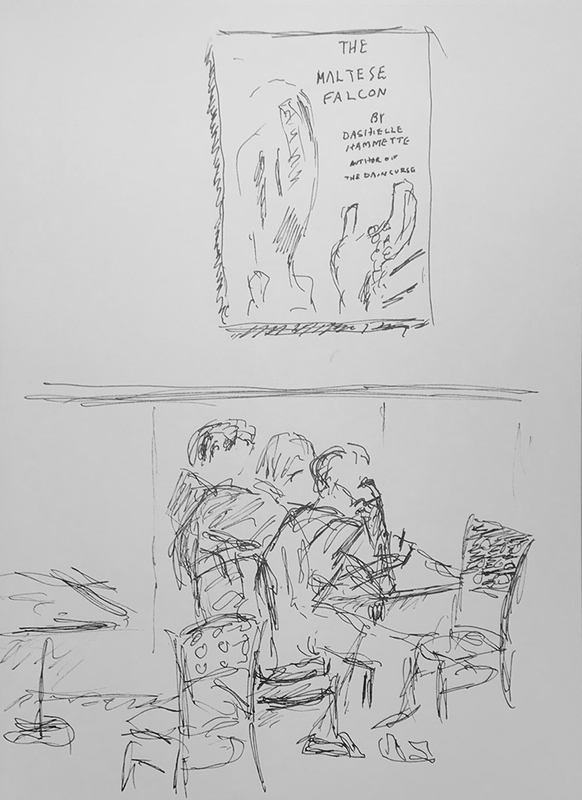 As I was trying to sketch the man below the Maltese Falcon poster, he shifted his body before I could scribble his pose; when I tried sketching him in his new position, he moved again. The resulting drawing reveals more information about the subject than a simple snapshot would. This entry was posted in Personal Stories and tagged 15 minute sketch, action portrait, artistic process, coffee break, creativity, drawing, pen and ink, portrait, sketch, visual art. Bookmark the permalink. I agree. Your sketch is a picture of mental restlessness, I think. I think so too, Claudia. Thank you!